10-year-old Blaine Baxter injured his arm in a go-karting accident last year. Painful daily dressing changes at the hospital made him so anxious he had to be sedated. Not only was the sedation costing money, but Blaine was still anxious before the sedation. Two weeks into his stay at Lucile Packard Children’s Hospital Stanford, a team of pain management specialists suggested he tried playing games using the Samsung Gear VR. This was such an effective distraction that Blaine didn’t need sedation anymore. 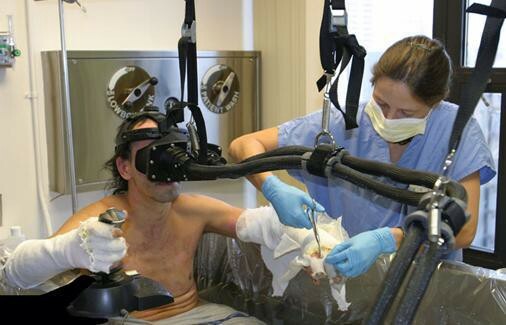 This is one case of many where virtual reality has been used to replace sedation or painkillers in a hospital. In this article, we’re going to explore this in more depth. First, let’s learn the basics of VR. Virtual reality tricks your brain into believing you are in a 3D world. VR does this using many different ways. The first way VR does this is with a stereoscopic display. This works by displaying two different angles of the world to each eye, simulating depth. Looking at this image, as you can see, the angle of the weapon is slightly different on each side. But when you put on the headset and play the game, everything looks perfect. The second way is using parallax. Parallax means that the further an object is to you, the slower it moves. Other ways include shading the world or manipulating field of view. Humans have a field of view of about 180 degrees when looking straight, but 270 degrees with eye movement. The human eye is very good at noticing vision imperfections, with tunnel vision being an example of such phenomena. 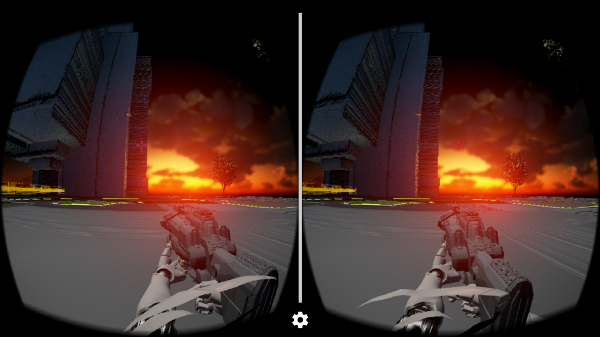 Even if a VR headset had a 180-degree FOV, you may still be able to tell a difference. The Vive and Rift both have 110-degree FOVs, Cardboard has 90, the GearVR has 96 and it is rumoured that Daydream may have as much as 120. This should generally speaking, greatly affect the VR experience. In short: there are many many ways that VR tricks your brain into believing you are in a different world. The important thing to note here is that VR tricks your brain (you) into believing you are in a different world. This is an extremely important point which we’ll come back to regularly throughout this article. The NHS (National Health Service of the UK) spends £160 million on over the counter painkillers every year. This is especially shocking when you realise that most people can purchase these painkillers for £0.35 at a local shop. The NHS is giving out free medication, which is easily purchased by anyone in the UK. Other painkillers, such as opioids, given out by the NHS don’t work so well with people who have chronic illnesses. People who use opioid painkillers for months or even years develop a tolerance to the drugs. This means that they need higher doses to achieve the same results, which results in hospitals spending more money. Dr. Rosenquist states that you can also develop a tolerance to regular painkillers. Not to mention that with opioid painkillers, 2 million Americans either abused or become dependent on them every year. Painkillers play an important role in our society, but most of the time people don’t need prescription painkillers. Having talked to a few doctors, they tell me that they mainly prescribe over the counter painkillers for something as minor as a little headache. Pain requires conscious attention. Virtual reality lets patients drift away from the real world. It tricks people into believing they are in a whole new world. While their physical mind is in another world, the pain they feel from their physical body is reduced. Studies have shown that ratings of pain during painful medical procedures drop 40–50% when patients are distracted by virtual reality. The exact usage of VR depends upon the need for it. If someone is experiencing a small operation or some dental work, a Samsung Gear VR and any game should be enough to distract them from the pain. The game itself does not matter in the simple cases. 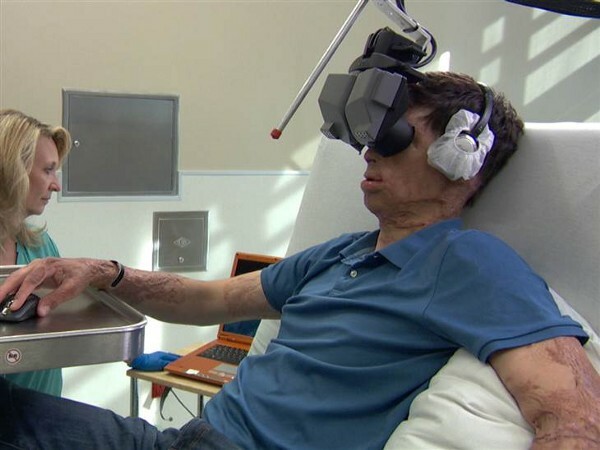 When using VR to change the dressing on burn victims, it has been shown that using a VR game which puts the player into an icy landscape helps reduce the pain. A beneficial effect produced by a placebo drug or treatment, which cannot be attributed to the properties of the placebo itself, and must therefore be due to the patient’s belief in that treatment. Hospitals can use VR as a distraction tool. In most cases, it is a highly effective distraction tool. VR is designed to trick your brain into thinking you are in another world. When your brain believes you are in this other world, you start to tune out of the real world you are in. This tuning out is what causes VR to be so effective in real-world applications like this. Of course, if you are treating burn victims who have burns on their face a normal VR headset would not work. You wouldn’t want to risk the VR headset getting stuck to their face and having to rip their skin off to take it off. This is where things begin to get costly and may not be so great in some circumstances. VR only works if it is attached to your face. If you can move your head around and have your virtual head move around. Because of this, hospitals use special VR systems for patients with burns. The exact system used depends on the patient. Take, for instance, the VR system on the left. This VR system is very out of the way and allows the nurse or doctor to do their work. But, notice it still has to be attached to the head. In this instance, the burn victim is undergoing a water treatment to soften scar tissue and remove the dead skin. VR systems, like electronics, do not play well with water. So this specially designed system has been made for use by burn victims who don’t have serious facial burns. 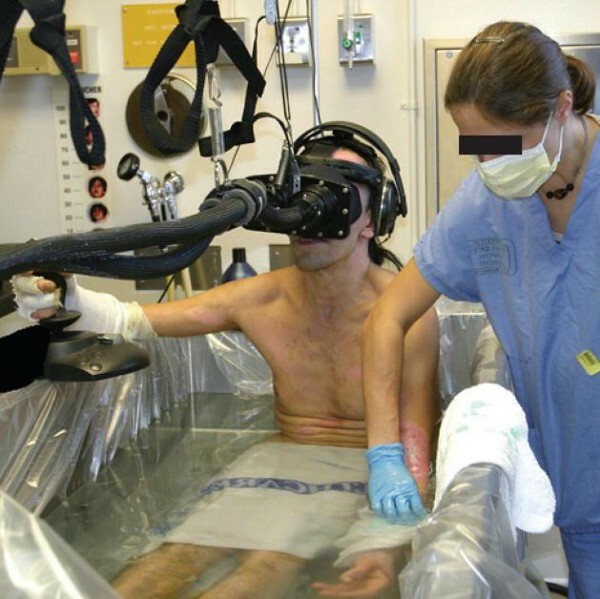 VR systems used to treat burn patients first came around in the early 2000s. Hunter Hoffman, a researcher at the University of Washington, launched the first pain studies in the early 2000s. Back then, the VR headset weighed 8 lbs and hooked up to a computer the size of a small fridge. This VR headset cost around £90,000. 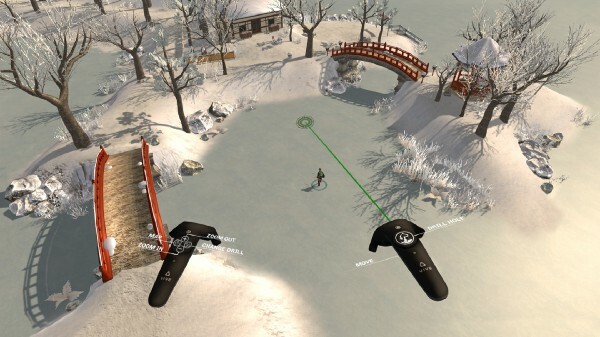 The VR would transport the players into a game called SnowWorld, designed in cool blues and whites. Burn patients often relive the moment they were burned while the doctors/nurses clean their wounds. By teleporting the player to a nice, icy, refreshing world the patients reported feeling half as much pain as they normally would do. In this instance, we have a burn victim with facial burns. The VR headset has been designed to immerse them, but not to “stick on” to their face. The headphones used are coated in such a way that they do not cause much pain. The exact design and layout for each headset changes, due to this still being a relatively new technology. In the case of young Blair earlier, a single Gear VR was enough to immerse him into another world and prevent Blair from needing a sedative. The exact design and layout for each headset changes, due to this still being a relatively new technology. Virtual reality is still changing lives every single day. Technology has the power to change the world, for the better. Using VR in hospitals is an example of something that isn’t relatively new, but is still coming into play. There’s so much to work on in this field, and the research shown has been positive. I urge you, if you are looking for a way to make a positive impact in the world using technology this is one of the ways you still can. Virtual reality isn’t a new subject, but the applications of virtual reality are being expanded every single day. This article was a brief introduction to how VR is actively being used in hospitals.